At least four species are so far known in Europe, but the genus is in desperate need of modern treatment. Pileus whitish to cream; cap margin incurved. Stipe cylindrical, concolorous with the cap. Flesh whitish, unchanging when exposed to air. 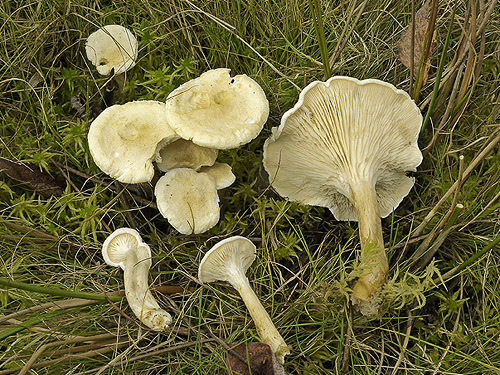 Gills whitish to cream, deccurrent (running down the stipe), forked. Spores 8–11(–13) × 3–4(–5) μm, dextrinoid. Habitat. In wet situations in meadows with rushes (Juncus spp.). Note. Close to H. pallida and treated as its synonym by some authorities, but having almost cylindrical spores of different size. Gminder, A. 2001. Hygrophoropsis (Schröter) Maire. – In: Krieglsteiner, G.J. [Ed.]. Die Großpilze Baden – Württembergs. Band 3. Ständerpilze: Blätterpilze I. Pp. 273–276. Eugen Ulmer Verlag, Stuttgart. Kibby, G. 2012. The Hygrophoropsis aurantiaca complex. – Field Mycology 13: 43–50. Kuyper, T.W. 1995. Hygrophoropsis (Schroet.) Maire. – In: Bas, C., Kuyper, T.W., Noordeloos, M.E. & Vellinga, E.C. Flora Agaricina Neerlandica. Vol. 3. Pp. 64–66. A.A. Balkema Publishers, Rotterdam. Reid, D.A. 1972. Fungorum Rariorum Icones Coloratae 6: 1–64, Pl. 41–48, Figs. 1–23.